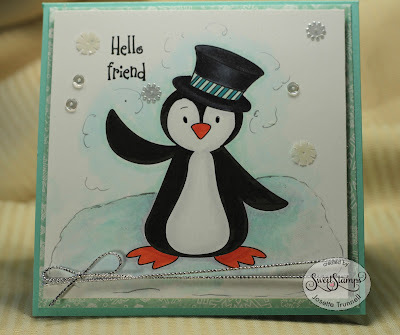 Josette here with another card using the soon to be released stamp sets. This is another penguin, a happy fellow, sending Hello wishes. This is a very simple card with minimal coloring. I used copics to shade the inside of the white area on the penguin, this gives dimension. Colored the feet and beak with Y06. The hat band was colored with BG57 and BG10. The majority of the focus was on the background. First I shaded around the image with C markers, C0, C01. Then went a little farther out with C2. Next I added BG0000 and BG 10 to create the "ice". Swirled B0000 in the "sky" around the Penguin. Lastly used a glitter pen to outline the "ice" and and add clouds. A few sequins, and a bow completed the image. This is a 5.5" square card and the image was attached using fun foam and Scor-tape. Stamps and supplies are available at : Sweet Stamps. 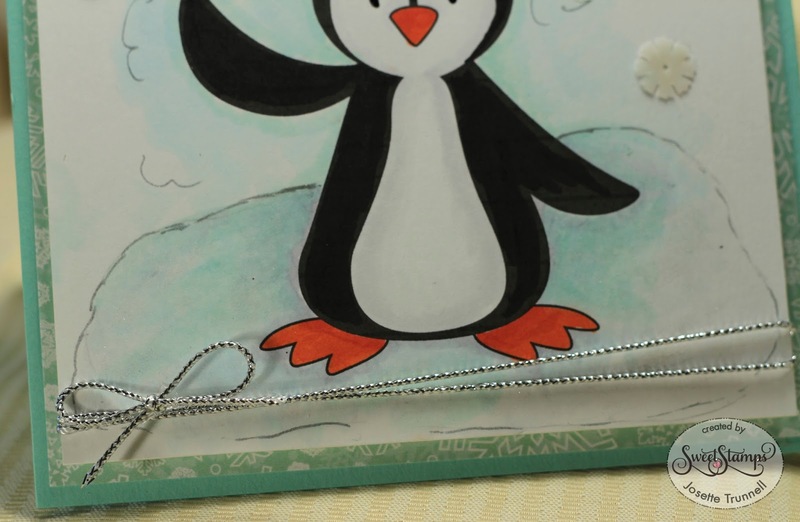 This card is so cool, love the background you made for the penguin.